Listing standards change sought by the Council of Institutional Investors (CII). CII filed petitions with the New York Stock Exchange (NYSE) and the NASDAQ, asking both to limit listings of companies with dual-class share structures. They have taken the right approach to address a growing problem. I hope it ends a worldwide race to the bottom for listing standards. Alternatively, adoption of the suggested listing standards could reestablish that US based companies are more democratic and accountable than counterparts based elsewhere. The petitions ask for listing standards to require that, going forward, multiple share classes with differential voting rights will convert within seven years of the initial public offering (IPO) to “one, share-one, vote.” This will ensure voting power proportional to an investor’s capital at risk within a seven year framework but still allows short-term dictatorships. While some companies that are controlled by virtue of special voting rights function as benevolent dictatorships, we have seen others stumble because of self-dealing, lack of strategic planning and ineffective boards. When problems emerge, external shareowners have little recourse. Now, a consensus is emerging—among investors, companies and the law firms and other IPO gatekeepers—that time-based sunsets are a sensible solution to the growing problem of unequal voting rights, which poses danger to long-term resilience of an increasing number of companies. BlackRock believes that equal voting rights are a fundamental tenet of good corporate governance. Multiple stakeholders – including listing exchanges and policymakers – must play a role in setting effective corporate governance standards to protect shareholder rights. We encourage U.S. exchanges to show global leadership on voting rights by requiring companies to either automatically convert or give shareholders the right to extend a multi-class structure. Doing so will re-establish the importance of equal voting rights for all public shareholders. A confluence of events has led to what we believe is a growing consensus on the issues surrounding differential voting rights. We would like to see the U.S. stock exchanges lead the process to find a solution that serves the long-term interests of all market participants. One of the strengths of the U.S. economy is the dynamism of U.S. companies. Successful American companies are constantly changing—and reinventing the way they do business. So it only makes sense that they should embrace change in their own governance that ultimately will strengthen shareholder value. CalPERS believes in one share, one vote. We also understand that early in a company’s public life, there may be a need for protections that enable management to focus on building out a company’s vision and creating the long-term sustainable shareowner value we are looking for as investors. We strongly believe such protection should not be perpetual, and mandatory time-based sunsets should act as an important safeguard against managerial entrenchment. A growing number of companies are making their public debut with time-based sunsets. Of 38 U.S. companies that went public in 2017 and 2018 with multi-class structures, CII has tracked 11 (29%) that incorporated simple time-based sunsets. A small but growing share of multi-class IPO companies have used time-based sunsets successfully. Examples include Groupon (converted to a single share class after five years), Texas Roadhouse (converted after five years) and MaxLinear (converted after seven years). Investors have soured on Snap and other high-profile companies (Altice USA, Blue Apron) that made their IPO authorizing zero-vote shares. Silicon Valley entrepreneurs like to boast about disrupting the status quo. With good reason: From Alphabet (Google’s parent) to Zillow, young tech companies have achieved success by upending traditional business models in one sector after another. But when it comes to how they govern their companies many founders embrace frameworks that are bulwarks against change. In recent years, a significant number of start-up companies, most but not all tech-based, have gone public with dual- or even triple-class stock structures with unequal voting rights that guarantee founders and other insiders voting control that can last decades—even as their equity stake shrinks. In 2017, we saw the advent of zero-vote shares for outside holders when Snap went public. Last year, 19% of U.S. companies that went public on U.S. exchanges had at least two classes of stock with differential voting rights. That is up from just 1% in 2005. In most cases, the superior class has 10 votes per share, while the inferior class has one vote per share. Supporters say this enables entrepreneurs to focus on the long term and resist pressure from investors to keep earnings growing every quarter. But this “founder knows best” approach challenges the bedrock corporate governance principle of “one share, one vote.” Providers of capital should have a right to vote in proportion to the size of their ownership. A single class of common stock with equal voting rights makes the board of directors accountable to all of the shareholders—and more likely to respond when management stumbles. Multi-class structures deprive public shareholders of a meaningful voice in how the company is run because the public shareholders lack the votes to influence the board or management. Academic research supports time-based sunsets. 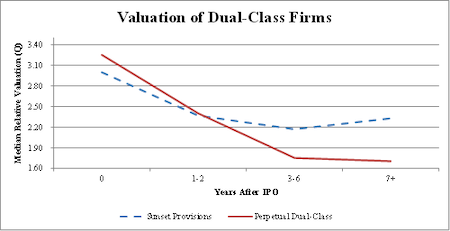 A recent study, “The Life Cycle of Dual Class Firms,” found that while multi-class companies have a value premium over single-class counterparts at the time of their initial public offering (IPO), that benefit fades to a discount six to nine years after IPO. Other studies show that multi-class companies have a substantially lower total shareholder return compared to single-class companies over 10 years. The Securities and Exchange Commission (SEC) believes it lacks the statutory authority to compel U.S. exchanges to amend their listing rules. Over the past year, providers of benchmark indexes—FTSE Russell, MSCI and S&P Dow Jones—have stepped into the breach, with varying curbs on multi-class companies in indexes widely used by institutional investors. Revised listing standards would put all dual-class companies on the same footing. The Council of Institutional Investors (CII) is a nonprofit, nonpartisan association of pension funds, other employee benefit funds, endowments and foundations, with combined assets that exceed $4 trillion. CII’s non-voting members include asset management firms with more than $25 trillion under management. CII is a leading voice for effective corporate governance, strong shareowner rights and vibrant, transparent and fair capital markets. CII promotes policies that enhance long-term value for U.S. institutional asset owners and their beneficiaries.